TWO. Change the words in brackets to mean more than one and write the new sentence. 1.The silver (fairy) flew high in the (sky). 2. The (monkey) in the zoo climbed many (tree). 3. The (bush) changed colour in summer. 4. The (farmer) went to the market to buy more (hen). 5. The (baker) sold (pie) to the (girl) and (boy). mop, ride, bite, swim, think, clap, shake, spring, stop, sing, give, score, spring, hire, apply, cry, create. Read the book, like it. Well described behind the scene politics, internal and external. Julia Gillard, a current PM, and who challenged K.Rudd and overturned him. Book review: The Party Thieves by Barry Cassidy. The Party Thieves, while strangely named, is a thorough reporting by Barrie Cassidy of the replacement of Kevin Rudd as the Prime Minister by the parliamentary wing of the ALP, the first days of Julia Gillard’s Prime Ministership and the 2010 election campaign up until the decision of September 7 that made Gillard Prime Minister in a minority government. The book dives right into the detail. It’s a great book for someone who wasn’t in Australia at the time. It’ll be a great reference for future generations of students of political science and journalism. The people who lived through it probably won’t want to relive it, although the political “tragics” will find this book nourishing. The book begins looking into the recent history of the federal parliamentary party and its leadership: with Mark Latham and Rudd’s campaign for the leadership. That Gillard had the numbers to replace Beazley with Rudd is an eye opener for me. Gillard didn’t simply have the ability. She also had the numbers. Rudd was the bridegroom, one that, unfortunately, disappointed the parliamentary party as well as the citizens of Australia. Өөр нэгэн Вики анягийн талаар манай хэвлэлээр өнөөдөр хангалттай гарчээ. www.wikileaks.org сайтын мэдээнүүд дэлхий дахинд шуугиан тарьж буй бөгөөд уг сайтын удирдагч Ассанж улсын нууц задруулсан эсэх талаар хэрэг үүсгэн тус улсын Холбооны цагдаагийн газар шалгаж байгааг Австралийн Ерөнхий прокурор Роберт МакКлиланд мэдэгдлээ (The Advertiser, 2010.11.20. p.5). Үг сүлжээгээр цацагдсан нууцын зэрэглэлтэй материалд Америкууд бусдыг хэрхэн дүгнэдэг талаар “инээдтэй&#8221; тодорхойлолтууд байх юм. Italian PM Silvio Berlusconi: “Feckless, vain and ineffective as a modern European leader&#8221;. He is a &#8221;physically and politically weak leader&#8221;. Iranian President Mahmoud Ahmadinejad: &#8221;Like Hitler&#8221;. tur post weekend hurtel, tnx. Татвар төлөх нь яалт ч байхгүй ҮНЭН. Австрали Улсын санхүүгийн шинэ жил эхэлж, татвараа бодох, манайхны хувьд бол буцааж авах ажил эхэлж байна даа. Юуны төлөө хэд хоног татварын тооцоо бодлоо, өөрийнхийгөө ёстой хэмх хөнгөлөөд дор нь бодоод гаргаад ирнэ гэсэн чинь бас нилээд бичиг цаас, бэлтгэл хэрэгтэй юм байнаа. “Энэ баян улс миний мөнгөөр дутав гэж” гээд үзэж тарсан чинь яалт ч байхгүй төлөх юмнууд байнаа. Гэхдээ хөнгөлөлт эдлэх заалтууд нь учрыг нь ойлгочихвол боломжийн юм гээч хөөе. Монголд хэдэн онд ч билээ орон сууцны бил үү, оюутны төлбөрийн ч билүү хөнгөлөлт эдлэх гэж үнэн их явдал чирэгдэл болж, байсны хажууд ойлгомжтой, хялбар юм. 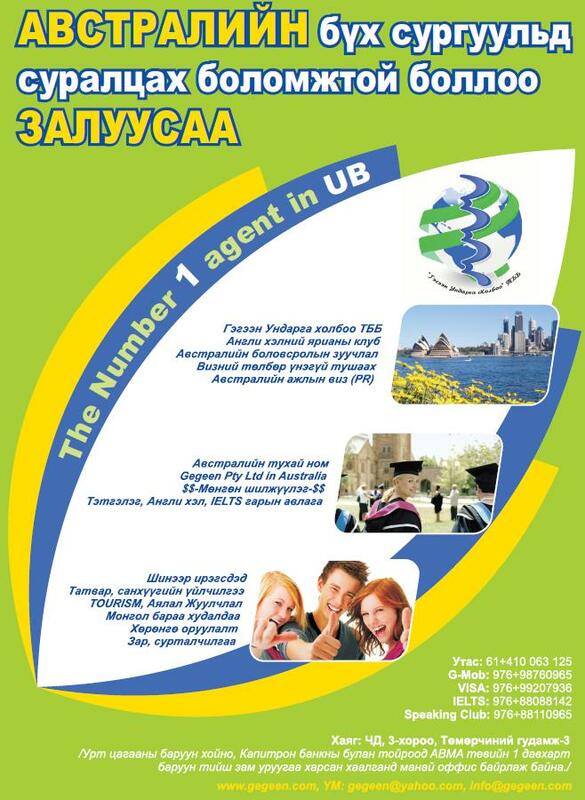 PAYG буюу pay as you go.